As Windows evolves over time, how parts of the operating look changes over time as well. One area that has gone through some small changes in recent years has been the taskbar and the tray notification area. From Windows 7 onwards, Microsoft started to make the tray area rather boring looking by turning a number of tray system icons from the colorful versions of Windows XP into monochrome. Another thing Microsoft also did was stop animating the network indicator tray icon. In Windows XP the network icon for a specific adapter would have two small indicators which flashed to represent incoming and outgoing traffic. Although the icon changed visually in Windows Vista you can still turn on the activity animation. From Windows 7 the icon has become a static white icon (middle image below) and it’s still the same in Windows 10 (far right). The activity indicator is quite useful for you to see if there is any network activity without taking your eyes off the screen. The indicator is also quite handy for wireless enabled computers because you probably cannot see the activity lights on the router you are connected to. If you are running an operating system newer than Vista you will have to find a third party solution. Luckily there are some tools around that can put an icon back in your tray to actively show network activity, here are five to look at. Network Activity Indicator is by IT Samples (another developer has a program with the same name) and it’s a simple but very effective tool to add an animated network activity indicator back into the system tray. The program is available as both a portable version and a setup installer with separate 32-bit and 64-bit editions for each. The default indicator icon is a Windows XP style but this can be changed to a more up to date Vista style by checking a box in the settings window. You can also choose a single indicator for all available interfaces or select up to three network adapters and display a separate indicator for each one. The tooltip shows the amount of data sent and received while the right click menu offers a few useful network related shortcuts along with a per interface traffic meter and a statistics window. 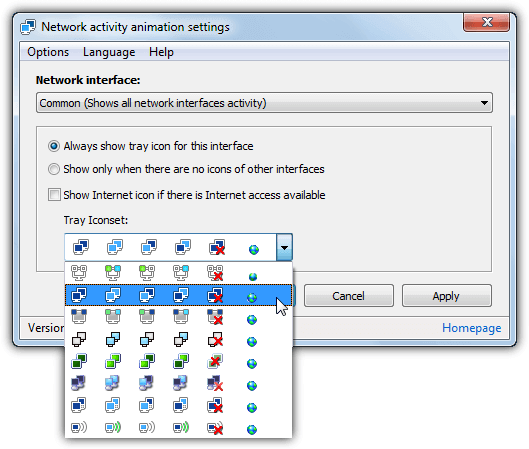 NetAnimate is a very simple program to use and it offers eight different activity icon sets including ones reminiscent of the Windows XP and Vista network activity icons. It’s also possible to create your own icon set because it is just a collection of six PNG image files. By default NetAnimate will overlay the small internet globe icon on the icon, which obscures the indicator. To turn it off uncheck the “Show internet icon if there is internet access available” box. Each network adapter can have its own indicator icon or you can use a single indicator for all connections. The tooltip for the network indicator icon shows a few useful bits of information like MAC, IPv4 and IPv6 addresses along with the amount of sent and received data over the network interface. Update speed, tooltip options and launching the program on startup settings are available in the Options menu. Although it has the same name, this is a different program from the Network Activity Indicator by IT Samples and hosted at Deviantart. In addition to showing the network indicator icon there is a simple bandwidth monitor if you left click on the icon. There is only a single icon type available which is reasonably similar to Vista’s icon but smaller. 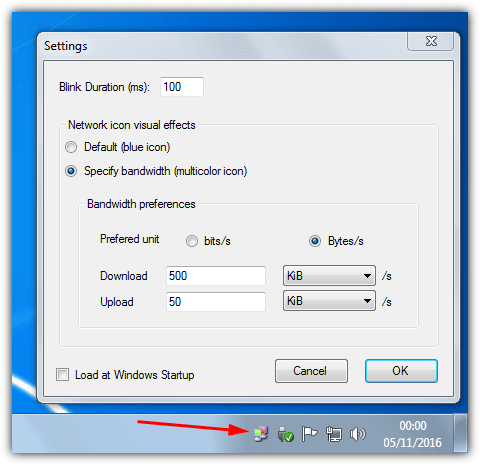 From the tray icon context menu you can switch between available network adapters while the tooltip will show the current upload and download speed. 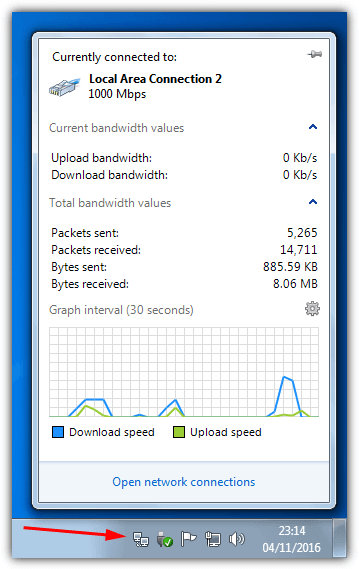 Click the tray icon to show the bandwidth window which displays download and upload speed along with total bytes sent and received. There’s also a small graph which shows bandwidth usage for the last 30 seconds. Network Activity Indicator is a portable utility. LanLights has been around since 2004 and was last updated in 2011. 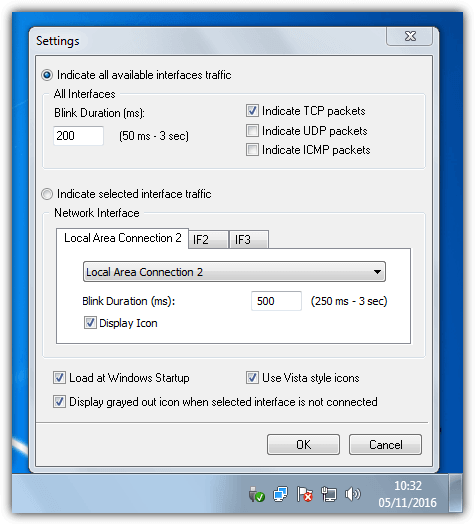 Besides the selection of different network indicator icons there is also a number of other options to monitor the connection. This includes network connection information, network adapter information and some activity graphs for sent and received data, processor load and memory usage. To choose a network activity icon from the selection open the main interface and go to Options > Change status icons (Ctrl+I). The choices are yellow send/green receive, all yellow, green or blue indicators, XP icons including a percentage indicator, a clone of the ZoneAlarm indicator or add your own. LanLights also has a few built in tools to ping/resolve hostnames and run a traceroute although the tools seemed to crash the program so are perhaps best left alone. One obvious way to get a network indicator in your system tray is to use a more traditional bandwidth monitor. 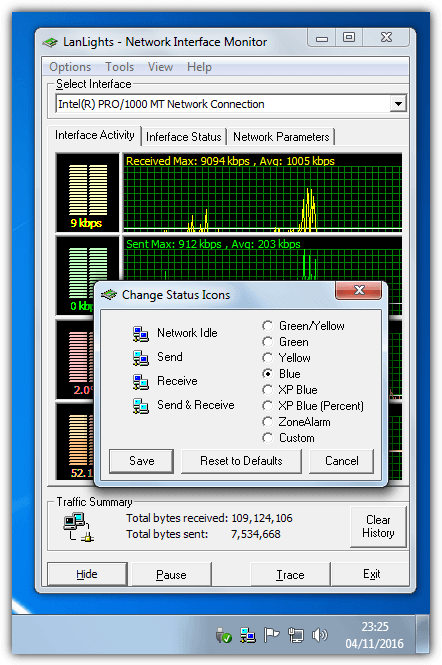 Many bandwidth monitor tools like NetWorx tend to use their own indicator. We have chosen to look at GabNetStats here because it’s portable, simple to use and sticks more closely to a standard Windows indicator icon. The indicator icon in GabNetStats is a standard Windows XP icon although there is an option to add a multicolored indicator animation instead of just the normal blue. The multicolor icon allows you to set a specific upload and download bandwidth and the indicator will turn, green, then yellow, then red when the limit is exceeded. As with most bandwidth monitoring tools, GabNetStats has several options for logging and getting detailed information about the connected network connections. Editor’s Note: If you want a more visible network activity indicator, an alternative to a tray icon is to run a program the utilizes the lights on your keyboard. With a program like Network Lights (by Network Activity Indicator developer IT Samples) you can make the Caps, Num or Scroll lock lights flash to simulate incoming and outgoing traffic activity. A great article, could be improved by addition of type of software (freeware, open source etc) and how ‘stale’ it is. I found GabNetStats is both free and open source, and relatively current – so I’m going with that! Awesome! The dumbing down of OSes has to end!